Today I am sharing with you a simple side dish that is perfect for summer picnics, or those week nights when you don’t feel like making much! 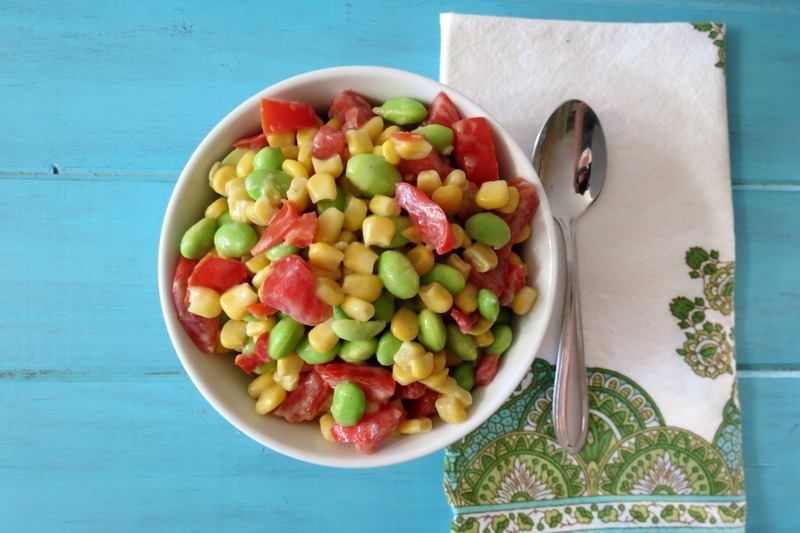 This side dish is also very versatile too. You can eat it plain, like we did or top it on salads, heat up and put in a burrito, the possibilities are endless. This is my Soycutash Salad with Creamy Avocado Dressing. Well I can’t take credit for this dish, since most of it comes from my beloved Trader Joe’s. 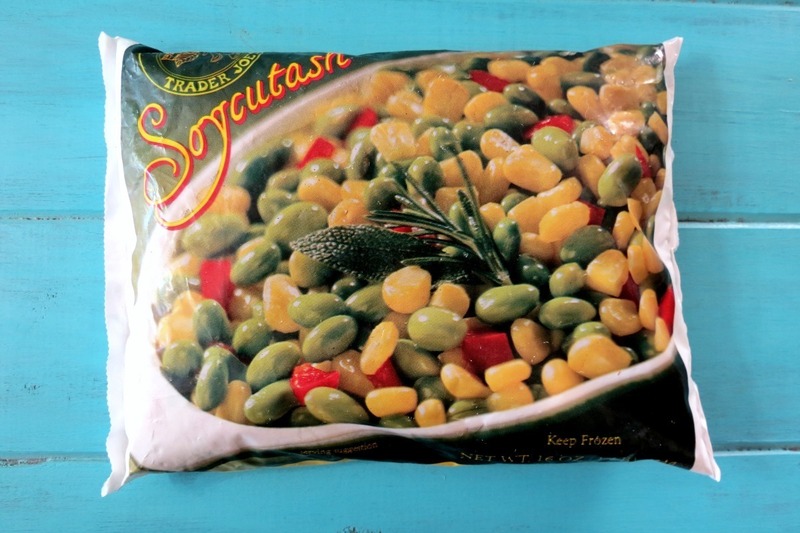 In the freezer section of TJ’s they have a frozen bag of vegetables called Soycutash. It’s a mixture of soy beans, corn and red bell pepper. I defrosted the salad over night in the fridge, tossed in some tomatoes and made a creamy dressing for it. It was so simple, that it took me longer to write down the recipe then to make it! Have you seen Soycutash at TJ’s? Here is the bag of what it looks like. I didn’t warm the salad at all, since I really like my vegetables to be more on the crunchy side. However my Husband said he would have preferred it warmed. That’s up to you on how you would like it. I would just heat it in the microwave for about a minute and I think that would work out great!! Then add the dressing! The dressing I topped on the salad was a creamy, light dressing made with avocado, greek yogurt, chipotle in adobo sauce and lime. The dressing is not spicy at all, but added a nice flavor to the vegetables. I really went light on this salad. With the hot heat, I didn’t want anything heavy. I’m more of a vinaigrette type person, but by all means if you like super creamy salads, double up on the dressing. If your to busy to make the dressing, you could always add a Goddess dressing or a creamy Cilantro type dressing. The salad is so easy and accommodating to what you like. That’s what I really like about cooking! You can take a basic idea and zip it up to your preference! 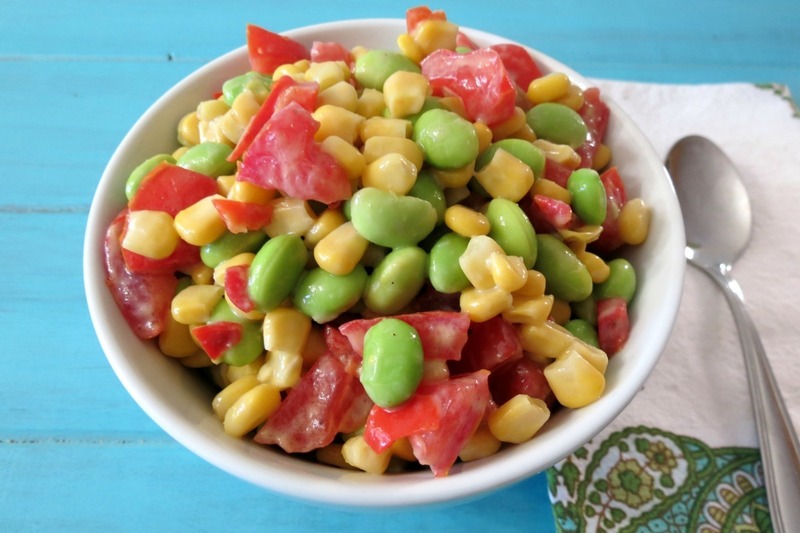 A light, refreshing salad made with edamame, corn and sweet bell pepper tossed in a creamy avocado lime dressing. 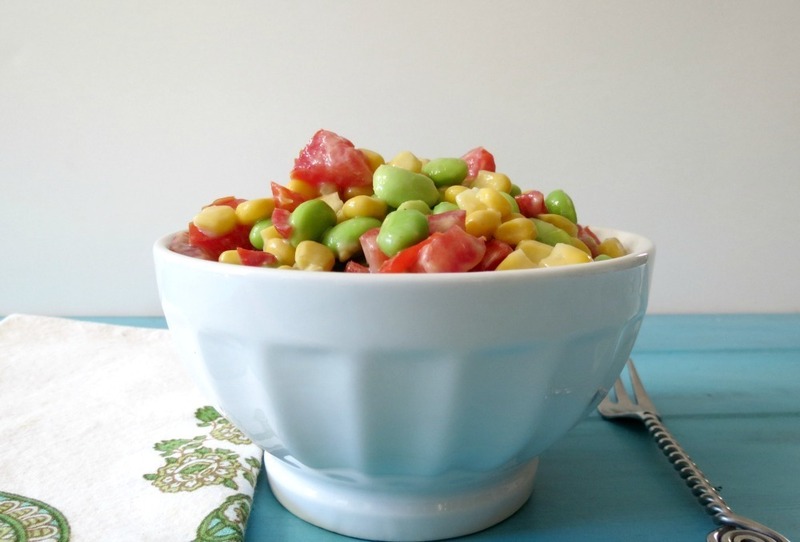 In a bowl, add the Soycutash and tomatoes; set a side. To make dressing: In a blender, add avocado, lime juice, greek yogurt, chipotle in adobo sauce and garlic powder. Process until smooth. To thin out the dressing, add milk about a teaspoon at a time. Add salt and pepper to taste. Pour dressing over vegetables, and refrigerate until ready to serve. Well Dinners, Drive-Ins and Dives is coming on and Guy goes to Buffalo, so I want to see where he goes! I just love that show!!! Sometimes, simple recipes like this one, are the best recipes! I loved the colours in the salad…so fresh and appetizing! I haven’t seen that veggie blend at TJ’s! What a great combo. 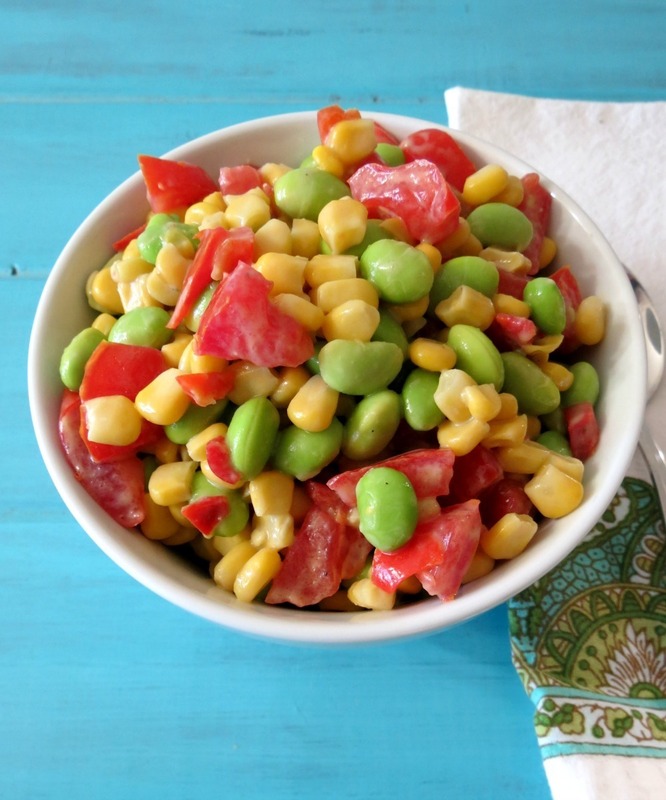 I love anything with corn and edamame! your avocado dressing is the perfect way to spruce it all up!